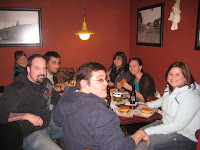 We began our “Glorious Pursuit of Delicious Burgers” back in October of 2008 we had no list of burgers to chase after. We just went blind on word of mouth, friendly recommendations and a few web searches. Soon we began to keep lists. In state, out of state, out of country, best burger here, most unique burger there, grass-fed, hormone free and so on and so on. Eventually names started to pop up on multiple lists and we had a course to follow. It was as though we were on the U.S. Enterprise, plotting a course across the universe of burgers. One such place began to pop up on all kinds of lists; Hamburger America, Digital City, Wall Street Journal, GQ and even on A Hamburger Today Reader’s Poll. Miller’s Bar was a must-eat burger. As a native Detroiter now living in NYC, I was sad to say I had never been to the place. With a trip home to visit family and friends for the holidays, I plotted my visit: a post-Christmas family trip to eat burgers! 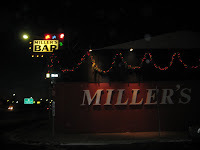 Located at the major intersection of Telegraph and Michigan Ave in Dearborn, MI, Miller’s Bar has been serving up burgers since 1941. It’s located in neighborhood that houses many of the Detroit-area car factories and is only a short drive from downtown Detroit. The place is always jam-packed and you should expect a wait. The bigger your party, the longer your wait. In a hurry? Too bad but your best chance is to arrive with 1 or 2 people and grab a seat at the bar. Be sure to have your order ready as the wait staff is extremely busy and won’t have the chance to wait on you hand and foot. But fret not, it’s an easy decision to make. The menu is so limited in fact, that if you click “menu” on the Miller’s Site, they only have a picture of a hamburger, a cheeseburger, french fries, onion rings and drinks. The Miller’s butcher starts grinding beef every morning at 4 am to make enough to supply the hungry customers. It’s all cooked on one flat top griddle in the middle of the restaurant which you’ll surely get to eyeball as it’s right inside the door. Notice that each fresh ground beef patty is the exact size and formed in the most perfect burger shape. 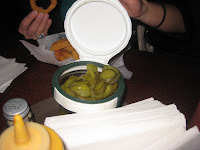 Mustard, ketchup and pickle slices can be found on the table and besides sliced onions that you have to ask for, your only other condiment choice is cheese. As my wife, my Mom, brother and his wife made our way down to Miller’s, my Mom reminded me that I had eaten Miller’s burgers before. While I don’t have memories of it, the wife of the couple that used to live across the street from us worked there and used to bring us home sacks of them. We parked our car, got in line and waited patiently watching the grill master cook burger after burger. Soon we were shown to a table and my other brother and his girlfriend joined us. George Motz claims the beef is so good that you don’t need any cheese but when that cheese is Velveeta, do what I did, get one with and one without. 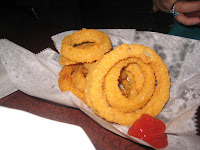 The fries and rings showed up first and we all dug in but not too deeply as not to fill up. 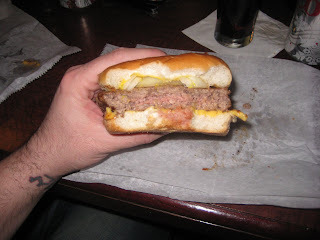 There are no utensils nor plates at Miller’s and the burgers are merely served on wax paper. When the server came rolling up to our table with a tray stacked with burgers, my eyes opened a mile wide and saliva began to run down the sides of my mouth. I ripped into the naked burger first. 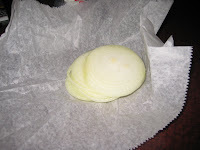 The white bun was steamed and soft and melted under the pressure of my teeth. A burst of juicy, freshly ground beef, right off the griddle, blasted it’s way across my tongue while doing a happy little burger samba right down my throat. This is the kind of burger that America was made on and by looking around at cornucopia of patrons inside Miller’s, it’s the kind of burger that Americans can rely on. After a few bites, I added a few slices of fresh onions and mustard. It just kept getting better. Just as I was finishing the last few bites of my burger, the server came over with my cheeseburger. 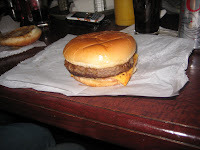 I’m a huge proponent of cheese on the bottom and that is just how Miller’s serves up their cheeseburger. While I have much adoration and respect for Mr. Motz, the fresh slice of Velveeta turned Miller’s burger from great to awesome! The creaminess of the cheese with its salty flavor was just the perfect pairing to this delicious piece of beloved American history. If I had not already been on a week long holiday food binge, I would’ve considered a 3rd burger. In fact, I almost ate the one we brought home for my step dad on the drive home. 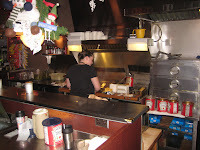 This entry was posted in Bar, Beer, Burgers, Hamburgers, Michigan and tagged best burger, burger conquest, cheese, ciancio, dearborn, detroit, french fries, hamburger, michigan, millers bar, nyc, rev, review, the rev meter for social community. Bookmark the permalink. Glad you made it there and brought a group. LOVE that burger and it's great to see it has not changed a bit. You may have talked me into cheese! The best part of the evening was being with my boys and their girls! And the hamburger wasn't bad either! I would love another right now! I've been there 5 times in the last 2 years and they never let me down! I'd say go for 2 Cheeseburgers anyway….2 burgers with Velveeta is better than 1. MMMM….so delish! Reading this is making me crave another. Matt and I are going to have to take a trip there soon! I, wife and friends ate at Miller's right after Christmas, after the first game of the Great Lakes Invitational college hockey tourament. Luckily, there was no wait as it was late-ish. I admit it – I ate two cheeseburgers. However, family friend Andy may have set some sort of record by – does one say "eating"? – eating two DOUBLE cheeseburgers. Unbelievable. Hmmm…I'm gettin' hungry. 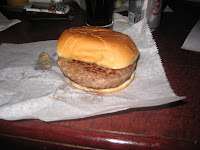 Just had my first burger there yesterday and I have to say I think it is one of the most over-rated bar burgers around. Yeah the burger is juicy but mostly nothing but grease. 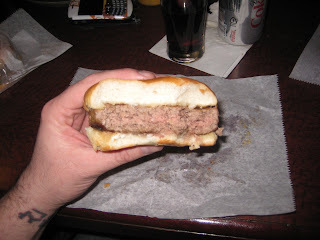 I have had this burger in countless other bars with the same flavor and size but a fraction of the cost. This is the most over hyped $5 burger I've ever come across.